Pakistan’s newly-elected government, which is expected to be sworn in within days with Imran Khan as PM, will plant billions of trees to tackle the effects of climate change. Malik Amin Aslam, who is tipped to become environment minister, said the 10 Billion Tree Tsunami program would see trees planted nationwide, including in the four provincial capitals. “PTI is a party with a green promise,” Aslam said, adding that the combination of environmental degradation and damage due to climate issues was costing 3-4 percent of Pakistan’s near-$300 billion economy annually. Aslam said the country was spending one billion rupees ($8.1 million) a day “on issues arising from environmental neglect”. “Climate change is only making it worse,” Aslam told attendees at a discussion on the environment and climate change at the Sustainable Development Policy Institute, a thinktank, in Islamabad on July 31. Aslam told the Thomson Reuters Foundation that Khan believed climate change was an enormous challenge that had to be tackled head on. And, Aslam added, Khan felt the PTI’s green promise was central to how the party views a sustainable future for Pakistan – with cleaner air, cleaner water and a country prepared to face up to and combat climate change. Khan’s party won 116 seats of the 272 seats in parliament in the July 25 poll, while the party of ousted and jailed premier Nawaz Sharif trailed in second with 64 seats. In 2013, Khan’s PTI won enough seats in Khyber Pukhtunkwa’s assembly to form the provincial government. It introduced a green-growth initiative to tackle deforestation, build more small-scale hydroelectric projects and overhaul national parks. The Billion Tree Tsunami project was part of that initiative. Aslam, the project’s architect, said it had changed the province’s landscape. He said Pakistan needs to do more. “Pakistan’s green cover is going down. Our cities have become concrete jungles and there is increasing air pollution. Our mode of development is wrong,” Aslam said. At the PTI’s launch of its ‘First 100 Days Agenda’, held a month before the July 25 ballot, Khan told the audience of party members and media that global warming “is a reality”. 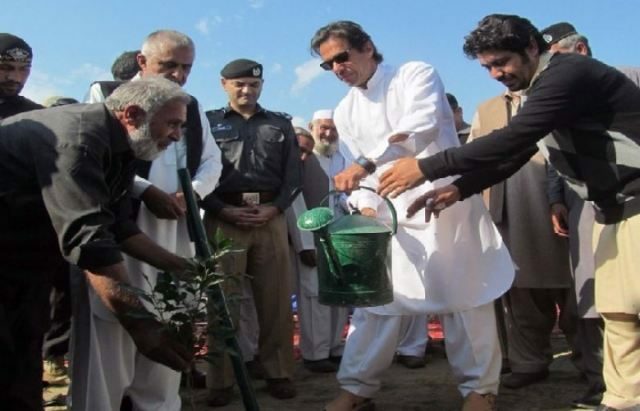 Khan lauded his provincial government’s tree-planting project, which he said had met its targets – 40 percent from planting trees, and the remainder from assisting the natural regeneration of existing forests. Pakistani climate expert Adil Najam, who is dean of Boston University’s Pardee School of Global Studies, said the PTI had made the environment – “especially planting trees” – its issue. “And (it has) demonstrated that you can get political mileage from environmental issues,” he said, describing that as a major step forward. He said the key test would be keeping the political focus on the policy, and ensuring action.